Lost teeth can be restored through removable bridge, fixed bridge or dental implants. Dental implantation is a better solution than the other two because it is permanent and natural looking. Dental implant changes the way you live and think. It is designed with an objective of providing a foundation for replacement teeth that acts as a substitute for the natural teeth. Dental implant or tooth implant has become a very popular choice now because of its numerous and varied benefits. When is an implant required? Who requires an implant? It is right for people that have jaw born simply without a tooth or lost one or more teeth due to injury, decay, gum disease or any other reason. Implant also serves as an abutment when several teeth are missing. When several teeth are missing, you don't have to replace every single tooth with an implant. You can fix an implant on either side of the space around the jaw and connect it with a bridge. Also, if there is a loss of only one tooth, it is better to have a single implant than taking support of two teeth and fixing crowns for those two. The finished product of an implant looks natural. A dental implant is made of titanium, which is a lustrous metal with a silver color, low density and high strength. Titanium is highly resistant to sea water, aqua regia and chlorine and because of these characteristics, titanium is used for implants. 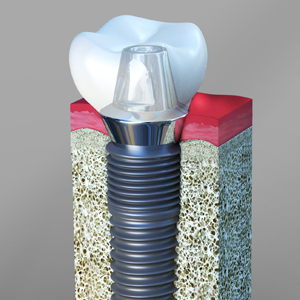 Implants are embedded in the jaw bone through a process called osseointegration. Premium brand implants come from companies that have been around for a very long time. They have exceptional customer service and they have lots and lots of capital behind them to support the service and the quality of the implants. On the other hand the Off brand implants are low cost and are imported from countries like China, Korea etc., Some of them are around only for a few years. The problem with off brand is that the patients may run into some issues and problems. We cannot figure out what kind of implant it is. We will have hard time to order the parts like caps or crowns, and finally we may have to remove the entire implant, do surgery, graft bone and reimplant again. Another disadvantage is that they do not have customer service. So, it very essential to choose the type of implant. Doctor with his numerous years of concentrated experience in dental implantation has taken him to the starring position in the dental field. Although he provides other services in dentistry, he is specialised in dental or tooth implantation. Doctor has a dental clinic in San Marcos dedicated to San Marcos and the surrounding areas.